Review: A middleweight boxing champion Matty Burton suffers a serious head injury from a boxing match once he gets home to his wife. He does this fight so he can secure his marriage, his life and his family. Once he wakes up from his coma he has to fight to piece his life back together. This film honestly left me no time to breathe. Based on a true story in which I knew nothing about. Don’t know anything about boxing apart from watching films about boxing. 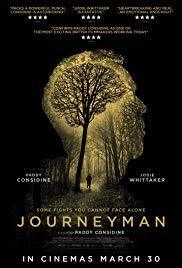 Written, directed and starring the fabulous Paddy Considine. This is an actor that keeps on shinning and gets better and better in the projects that he does. He is so good that I didn’t think that it was Paddy Considine acting and thought many times that it was the real person. He was totally convincing in his role. Considering Jodie Whittaker had little to work with I was really impressed with her and thought she did a fantastic job of her role. This is the second film in which Paddy Considine has worked with Anthony Welsh. The first one being “The Girl With All The Gifts” (2016).